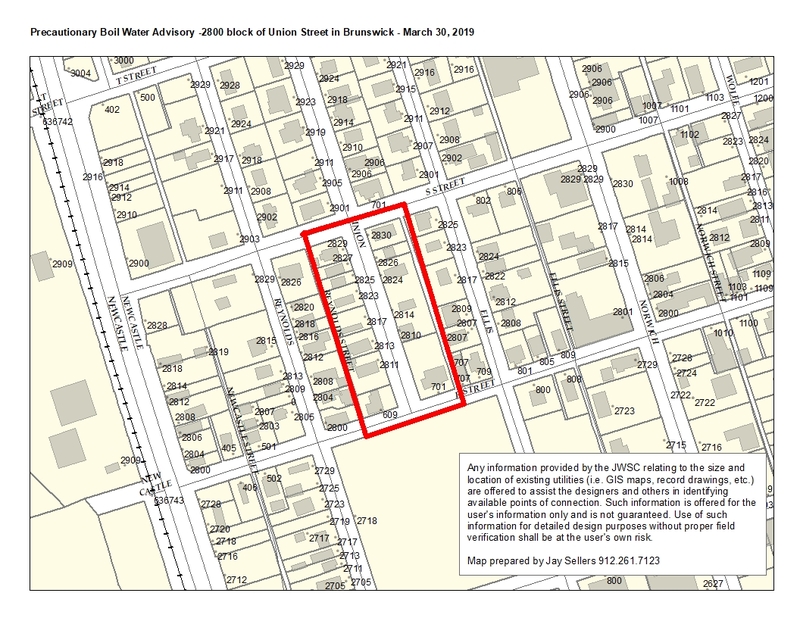 The Brunswick water system lost pressure in the area serving the 2800 block of Union Street, between R Street and S Street, on Saturday, March 30, 2019 due to the failure of an adapter fitting on a 2″ PVC main. BGJWSC staff is onsite now restoring service. Once service has been restored, BGJWSC lab personnel will collect water samples for testing. This testing, which takes between 18 and 24 hours, should be completed the evening of Sunday, March 31, at which time an all-clear message will be posted. This loss of pressure in the distribution system may cause back-pressure, back-siphonage, or a net movement of water from outside the pipe to the inside through cracks, breaks, or joints in the distribution system that are common in all water systems. Such a system failure carries with it a potential that bacterial contamination or other disease-causing organisms could enter the water distribution system. These conditions may pose an imminent and substantial health endangerment to persons served by the water system. DO NOT DRINK THE WATER WITHOUT BOILING IT FIRST. Bring all water to a rolling boil for at least (3) three minutes, and let it cool before using, or use bottled water. Boiled or bottled water should be used for drinking, making ice, brushing teeth, washing dishes, and food preparation until further notice. Boiling kills bacteria and other organisms in the water. ALL STORED WATER, DRINK OR ICE MADE RECENTLY FROM THIS SUPPLY SHALL BE DISCARDED. Bathing, showering and toilet flushing may be performed using water from the tap without boiling it first. Inadequately treated water may contain disease-causing organisms. These organisms include bacteria, viruses, and parasites which can cause symptoms such as diarrhea, cramps, nausea, headaches, or other symptoms. They may pose a special health risk for infants, young children, some of the elderly and people with severely compromised immune systems. As soon as pressure can be restored to the distribution system, our water lab personnel will take water samples that will be fully evaluated over the next twenty-four to forty-eight hour period following the repair of the main. Once we have determined that there is no longer a threat of harmful bacteria in the water, we will inform you that you are no longer required to boil your water by posting an update here on our website: http://www.bgjwsc.org. This entry was posted in Boil Water Advisory on March 30, 2019 by Jay Sellers.